Food TV Cooking Club: January | Mmm, Tasty! This month’s recipe challenge was Anthony Sedlak’s Cottage Pie. 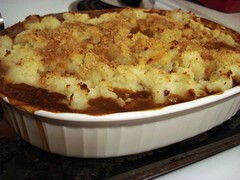 For those wondering what a Cottage Pie might be, it is a Shepherd’s Pie made with beef instead of lamb. Still confused? Well, these days it is common for people to call any ground meat and potatoes pie a Shepherd’s Pie, but traditionally, only one made with lamb would have that name (Hence the Shepherd!). For more info, just read here. Regardless of what you call this, Cottage Pie is either the ultimate in comfort food, or a childhood horror you’d rather forget. For me, who went vegetarian at the age of 13, it is more a comfort food thing; I didn’t eat much meat pie as a kid! For Rich, who had an English step mother for a few years, it is a bad childhood memory. He tells me his former step mother’s version contained unseasoned beef, bland potatoes, and corn. Doesn’t sound terribly appetizing, does it? This version of the recipe is packed with flavour, unlike the recipes you might remember from childhood. I used vegetarian ‘ground round’ instead of meat for the main filling, and added in the vegetables as per the recipe. It was flavoured with thyme, bay, rosemary, tomato paste, vegetarian broth, and red wine. The potatoes were also well seasoned: garlic, milk, butter, Parmesan cheese, salt and pepper. End result? Rich and I both really enjoyed it. It was the perfect meal after a long day of packing and sorting our apartment in preparation for moving day.